I'm looking to buy a greenhouse but while doing so on Ebay I noticed that there are several sellers offering 3/3.5m polytunnels at considerably lower prices than greenhouses. One advantage that I can see is that a polytunnel would be safer than a glass greenhouse with kids around. I'm looking for some advise on what are the pros and cons of polytunnels. Apart from saftey, it does seem that you get better colour on plants in a Polytunnel as opposed to glass and as you've noticed they are cheaper. But polytunnels need recovering more often (about 10 years I believe), although as with glass it depends on your particular site conditions. But I've no personnal experience. I planning on building a hybrid - Greenhouse style but clear plastic roofing sheets instead of glass. 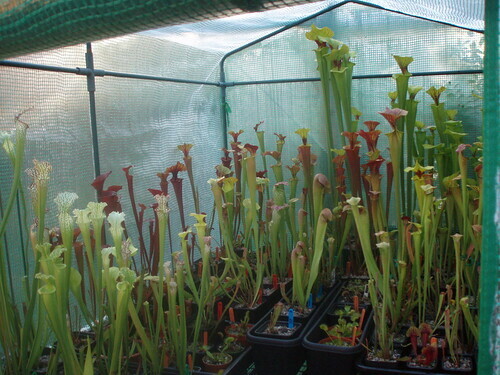 We have a 25ft x 10ft polytunnel on our allotment housing the 'overspill' of our sarracenia, drosera and flytrap collections. Shop around for you polytunnel - we bought ours from Two Wests and Elliot only to find that we had saved money as it actually came from Northern Polytunnels. We paid about £350 and it has been a godsend. The polytunnel feels warm even in the winter which means that even flytraps manage well. 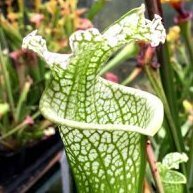 The polytunnel produces fabulous results with the sarracenia particularly loving the conditions. At this time of year it is very hot inside so to reduce any potential problems both end doors (recommended - don't get a polytunnel with one door) stay open all day and night. Blackbirds feast on the slugs, frogs feast on the flies and slugs, and the slugs, well they try to do damage but the predators far outnumber them. The only negative point is putting the damn tunnel up - you will need friends, a warm day to stretch out the cover, patience, a very flat area and beer to bribe the friends with. In addition one friend should be tall as they will be essential in pushing the central arches up once the cover is on. A word of warning - there is a nack to putting up one of these tunnels. Also don't forget the anti-hotspot tape to lengthen the lifespan of your tunnel cover. Having now experienced greenhouses and polytunnels I prefer the latter as they are cheaper, big for the price and make your cp collection look amazing! My poly tunnel is now erected & ready for use ! Had bought poly tunnel b4 my interest in cp's however they do seem to be a good option I'm reliably informed - as I initially thought mm should have bought a greenhouse. Not huge but ideal for me but will probably wish I'd had a bigger one ! Doors need a little attention - otherwise very pleased - not finished as yet. Sorry, a bit of a bump. http://cgi.ebay.co.uk/ws/eBayISAPI.dll?Vie...#ht_2721wt_1137 - I want the largest one of these, ive noticed the green cover. Does it look worth buying for cp's? That'll blow away in winter I suspect. Hayden - may be better to go for a clear cover though to let me more light through rather than green?? 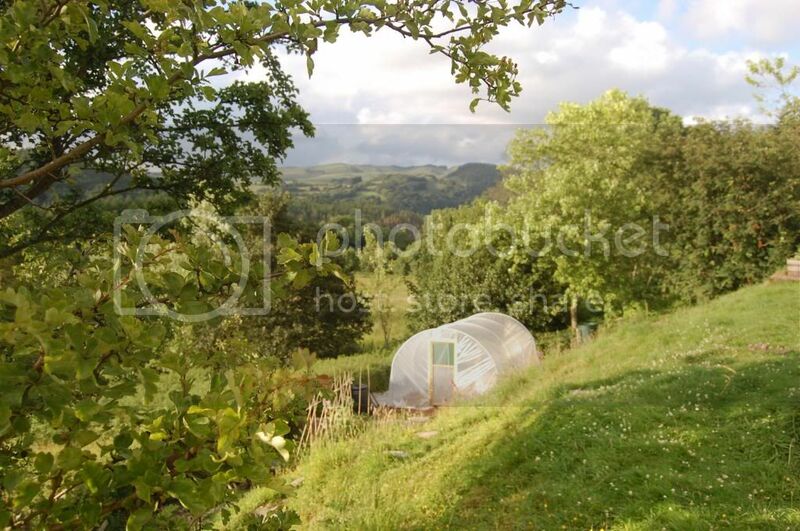 Dont really have much knowledge of polytunnels though. Greenhouse just feel a bit sturdier, if I put a polytunnel up knowing my luck it would blow away, lol! There's also the advantage of shelves with greenhouses too, every bit of space counts! If I could get some space on an allotment I would have a polytunnel though, much cheaper than a greenhouse and I've heard the same about them giving really good colour. I think a greenhouse blends in nicer in a back garden though........though mine is quite small so maybe thats why. Well this is the problem I have, I only really want one as theyre cheap. Most of you guys get a nice greenhouse from money youve made from a few sales of spare plants. I dont really have that, £60 is affordable and will also allow me to kit it out. Im pretty sure it wouldnt blow away, so many people have been happy with a sturdy order from them. The green does put me off, maybe I could message the seller asking for a clear colour? They do call themselves the polytunnel experts so I doubt green has too much of an effect. I've got a 6 X 4 plastic greenhouse which looks to be the same material (see pic). I've used it for about 3 years now and it hasn't blown away (yet) but I do have it tied to the decking and the plants also weigh it down. It does give good colour if the position is good. The spare covers for mine are about £15 but I wouldn't buy anything bigger as they just don't last. My plan is to get a proper polytunnel for next year as they are supposed to last at least 10 years. Thanks Andrew, I better make sure I buy some of that tape if I do end up buying a polytunnel then! What do you mean by a 'Proper' polytunnel? I got one of these a few weeks back (2.5m x 2m) and was pleased with the quality. managed to win the ebay auction at £30 so figure if it only lasts a few months it will be worth it. The polytunnel is fairly clear in colour the green look is from the reinforcing mesh. It lets in loads of light but diffuses the real mid day glare. I'd say go for it for the price and as long as its not to exposed you should get a good life out of it. The link that you had showing the ebay items look to be a larger variant of my 6 X 4 plastic greenhouse. It is basically a plastic tent using a hollow tube framework. The covers are only designed to last 18 months at best (according to Gardman who are the company who sell me the covers) and I find that the cover starts to split after 5 - 6 months and then I have to start taping it together. I basically start with a new cover in about March and need to start taping by the end of August/ beginning of September. They advise that because of the wet summers we have been having that the covers do not last as well. I originally bought mine because we were renting a house and I needed something for a couple of years that I could transport easily. If you have the space you can pick up second hand greenhouses for next to nothing if you are willing to collect and dismantle. Proper polytunnels are designed to last a lot longer and are sturdier. They are a solid structure and tend to be concreated in. By exposed im guessing you mean exposed to the sun. Its good to know someones bought one and recomends it, is yours south facing and available to wind? Well this is the problem I have, I only really want one as theyre cheap. Most of you guys get a nice greenhouse from money youve made from a few sales of spare plants. I dont really have that, £60 is affordable and will also allow me to kit it out. Used greenhouses can often be obtained for free, or very little money if you're willing to put in some effort in moving one. Check out you local newspaper free ads and see if anyone is trying to get rid of one, or even put a free ad in offering to remove anyones unwanted greenhouse. Ok mobile, ill check out the local sites. I used to pack it up in November and put it up again in March. I'm pretty sure it would have blown down, taking all my plants and shelves during the 3 winters I had it. We've had a pretty calm couple of winters, but it would not have survived January 18th 2007. I got my 8 x 6 glass greenhouse for free. Look in Loot - they're often in there if you're prepared to take a friend and dismantle it. By all means go for the plastic greenhouse, but I'm just saying there's a chance it'll blow down in winter. If I had more space, I would have polytunnels as well, but the decision for glass was the fact, apart from cleaning was it was maintenance free. The other advantage from having had a polytunnel before was also one could see the plants through the glass. If monbey was no object for would be buyers, go for a powder coated white greenhouse as the light reflectivity gives maximum colour to the plants just like in a polytunnel. Ok Mike, ive checked out eBay and theres a few starting at about 10p, it will take an hour to collect but its worth it for such a bargain! What did you do in the end Hayden? 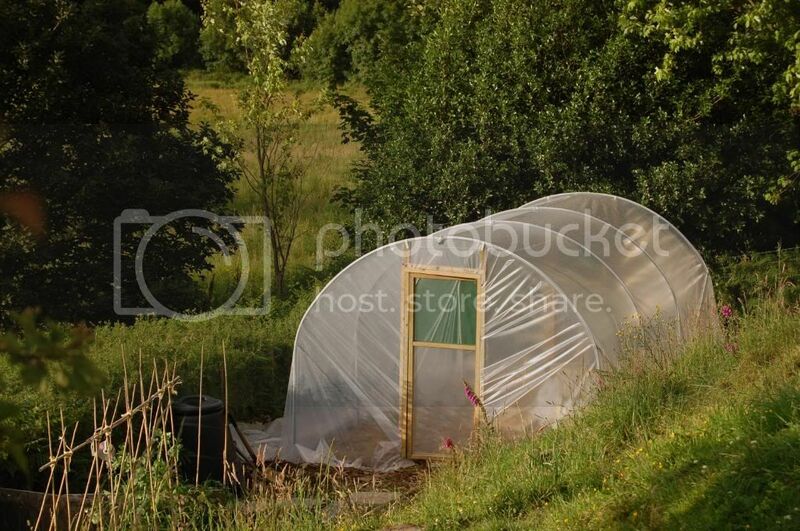 im also in the hunt for a new greenhouse and was looking at the same greenish polytunnels on ebay but have been put off by what some people have been saying about them, and also keeping an eye out for a cheap 2nd hand one like yourself I cannot afford to spend hundreds of pounds on one. There's a solution to that problem my friend..it's called "Saving"
One has to have spare cash in order to save.